The yacht inflatable water slide can be simply designed to hook onto a rail or be secured to your deck. 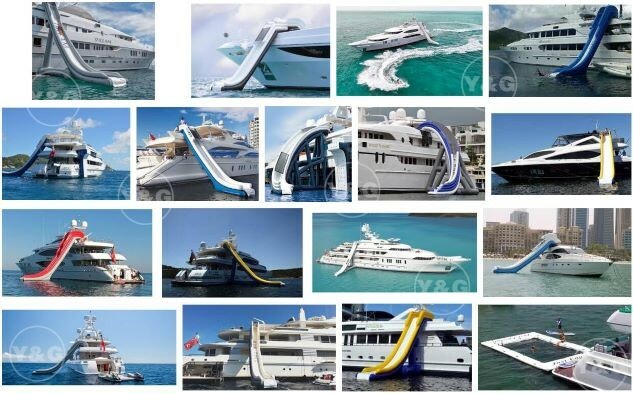 The special yacht inflatable slide has a hook design on the top to be attached to your yacht handrail, so that you can easily climb onto the slide and slide into the water. The surface of this inflatable slide can be tailored to your yacht's style and color to make it more in line with the style of yacht. That's why your yacht is more fun than others, and with the yacht inflatable water slides, your yacht will become a special water park!